California released the price for its Obamacare health care exchange, and the story in the media is that the premiums are a lot lower than expected. The Wonkblog in the Washington Post put together a breakdown of the cost, with and without subsidies, for various plans at income levels up to 400 percent of the federal poverty line. The blog seems pleased with the way the California exchange, Cover California, has come together. But just because the costs are lower than projected doesn’t mean the care is cheap. A Forbes blog points out that the new rates for health insurance premiums in California are more than double the cost of premiums without the Affordable Care Act and its exchanges. But putting that aside for the moment, these people still have to purchase this mandated insurance, or pay the fine. Assuming these people would not have purchased insurance without Obamacare, the chart below uses the premium information from the Post blog to calculate the percentage of pretax income that will now go to purchasing the mandated health insurance. This chart uses the Cover California exchange’s “silver plan,” which covers about 70 percent of health care costs and displays the out-of-pocket cost for each income group after the subsidy. As you can see, those at about 150 percent of the poverty line receive a substantial subsidy, which keeps their costs relatively low. But when looking at the costs for those in the 200 to 400 percent of the poverty line groups, Obamacare takes a chunk out of their monthly paychecks. For a 25 year old who makes about $34,470 a year (300 percent of the federal poverty line), the least expensive version of the “silver plan” will cost them about 7.5 percent of their pretax income. For a 40 year old who makes the same, the least expensive option will be a little over 9 percent. When we look at the more affordable “bronze plan,”the cost drop to nothing out of pocket for those at 150 percent of the poverty line and down to about 6 percent of income for the people at 300 percent of the poverty line. This, in itself, doesn’t sound awful, but if we assume these people purchasing health insurance prior to Obamacare, things look bleaker when we consider the costs they were paying without Obamacare and what will they will pay under the Affordable Care Act. According to an article in Forbes, the average costs of the five cheapest plans in California runs $92. For the people at 150 and 200 percent of the poverty line, the ACA, through Cover California, saves them a monthly $92 and $26, respectively. But for those above that threshold, they see their costs go up. Those at 250 percent of the poverty line will pay an additional $45 a month, as those at 300 and 400 percent of the poverty line will see their monthly health premium nearly double for similar care. 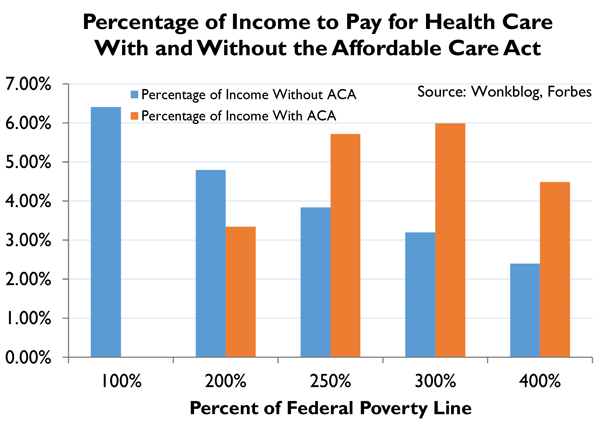 The graph below shows this comparison as a percentage of income with and without the Affordable Care Act. For more on the distributional effects of Obamacare, see here.